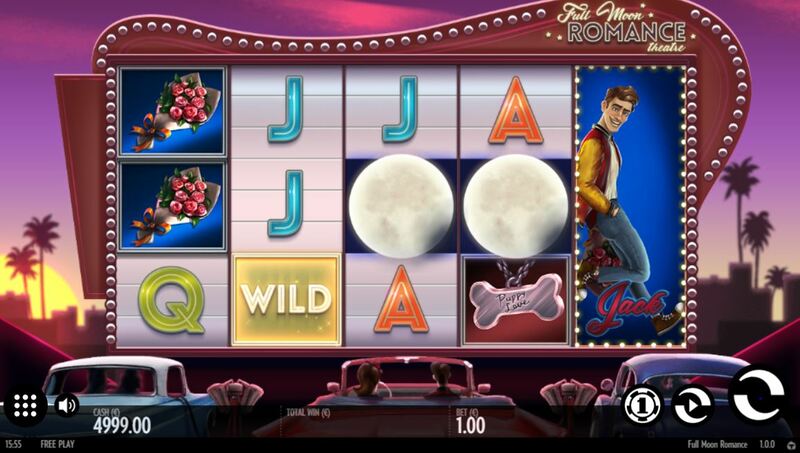 Full Moon Romance slot takes us back to the USA in the 1950's as we view the reels on a drive-in movie screen and watch them spin from the front seat of our convertible as we listen to a gentle guitar serenade. A classy looking game which has similarities in theme to Playtech's Cinerama or Microgaming's Golden Era, although I'd say those two take us right back to the beginnings of Hollywood before the time of drive-ins and teenage romancing in front of the big screen. Will Full Moon Romance prove to be a blockbuster or a box-office flop? We get the usual 5 reels of 3 rows and only 15 pay lines but we are assisted by the symbols being stacked on all the reels. The three characters are all known as 'Sweethearts' and consist of a blue boy, yellow boy and red girl and all pay 15x bet for a 5-of-a-kind win. The Puppy Love pendant awards 7x, bunch of roses 6x and there are 4 card values from 5 down to 3x for a full line. You will see Wilds appearing singly which don't multiply and award the same pay as the Sweethearts, but before scatters are mentioned we can first visit the Clone Feature. If any Sweetheart lands fully stacked on reel 1, it will freeze and the light bulbs surrounding the screen will light up and the Sweetheart will be cloned to at least one and up to all four of the remaining reels. The reels that aren't filled will spin and hopefully land the same icon in any gaps for some decent wins. If you fill all 5 reels you get the top pay of 225x bet for the spin. We need to see 3 or more Full Moon scatters to trigger 10, 15 or 20 free games. 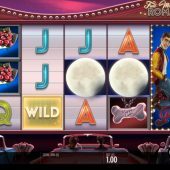 Our Sweethearts have now turned into Werewolf versions of themselves and will pay mixed during the free spins with the same value as the individual ones in the base game. You will also notice the Clone feature occurs more frequently during the bonus round which can be retriggered too.